I attended Winslow School starting with kindergarten in 1970 and continuing on through third grade. While I was there, I once got to see the coal cellar, but I never got to see the top floor because it apparently didn’t have adequate fire escapes. According to my neighbor, Miss Jeannette Schroeder, who attended Winslow starting around 1910, the top floor used to be used for plays and dances. 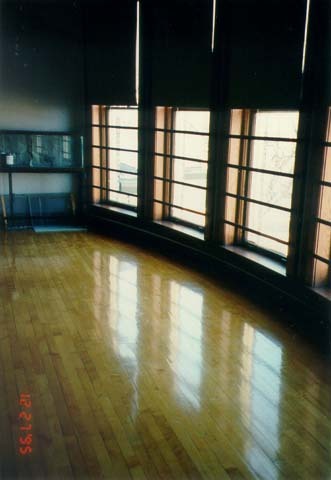 In 1995, when I was home for Christmas, my dad arranged a tour for me of the top floor of Winslow. I was delighted, and I took along my camera. I like how the huge beams in the ceiling were joined together. 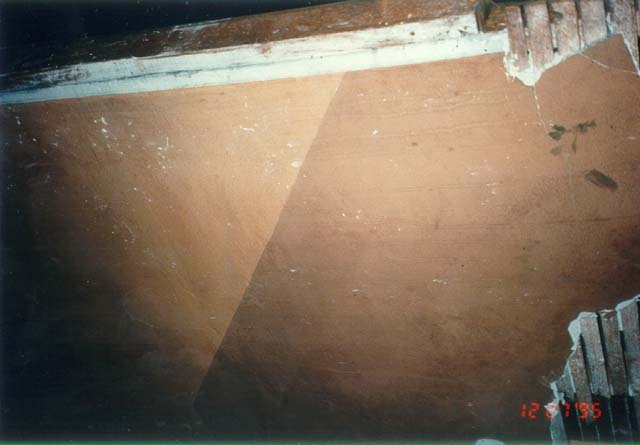 A hole had been cut in the beadboard ceiling, probably to work on a leak. 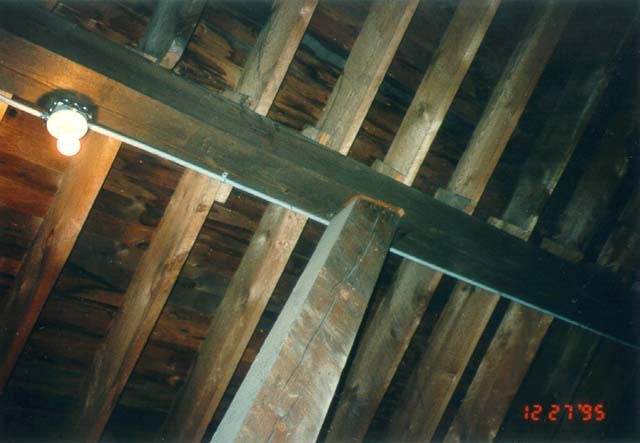 Another view of the ceiling beams. I'm not 100% sure that this door was in the top floor (it may be in the basement), but the way the newel post was set into the wall was interesting to me, like the wall came after the post. 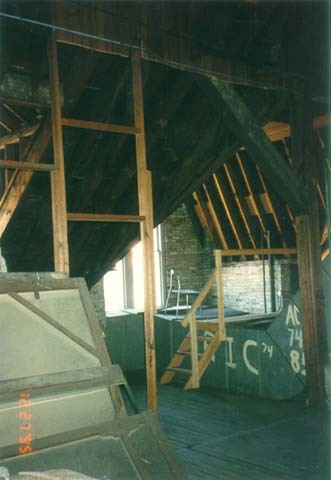 This shows some of the giant ducts in the top floor, here with some painted graffiti. 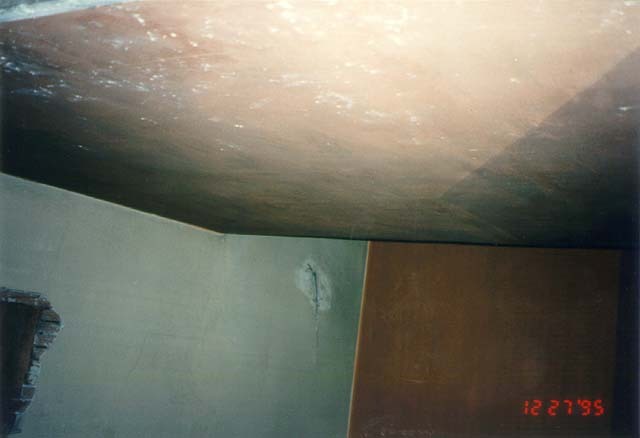 Notice how stairs have been built to allow you to get to the other side of the duct. 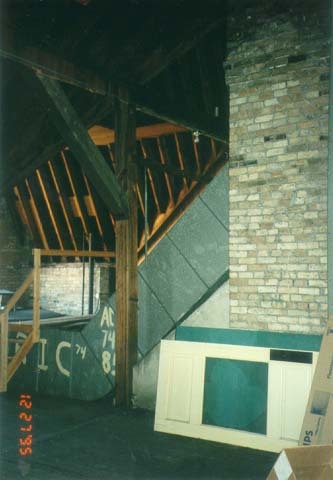 Another view of the ducts and the stairs. Here is the most finished-looking part of the top floor, facing the windows that look out over the playground. They also could be the windows that face the back of the school. In any case, I imagine this is more like what Miss Schroeder would have seen when she was going to Winslow back in 1910. In the east end of the top floor, there was an odd room that had been built in the middle of the floor, framed in, and plastered and painted on the inside. 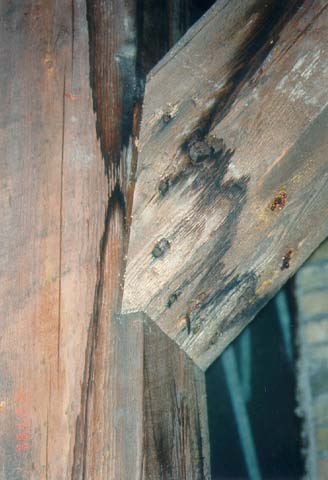 The floor of the room had been raised above the main floor. 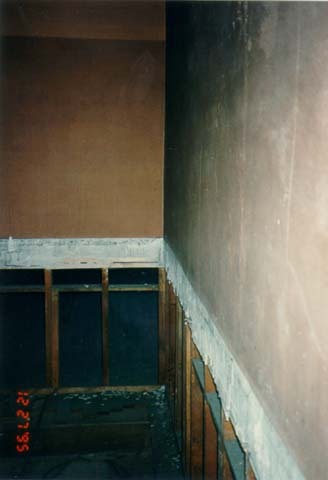 Here you can see a white line along the walls where the room's floor used to be. I thought of this room as "the secret room." I have a hard time imagining what it would have been used for. It seems like it would have been almost soundproof. The ceiling had different shades of beige or brown paint across it. 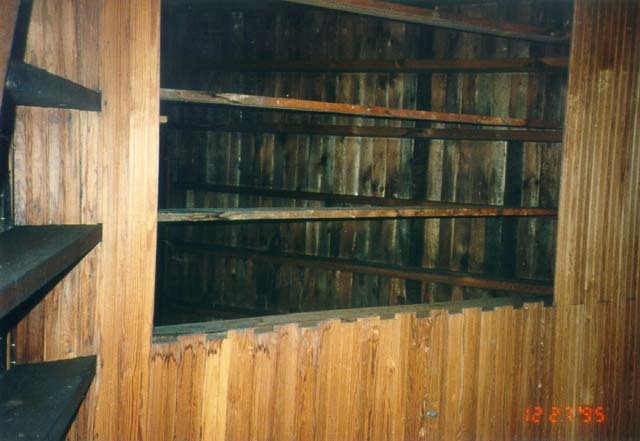 Ceiling and walls of "secret room." 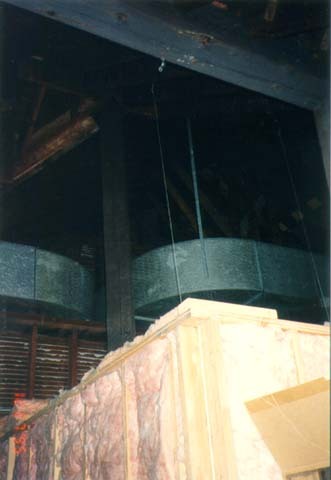 Outside of the "secret room" showing the insulation and the framing. 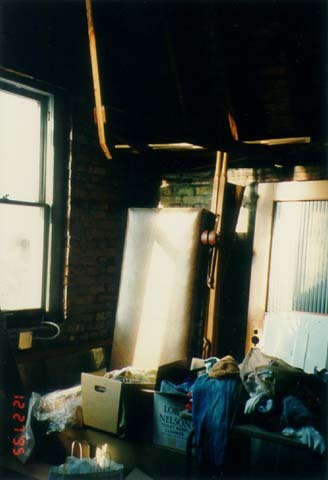 Some of the stored items stacked up in the corner. 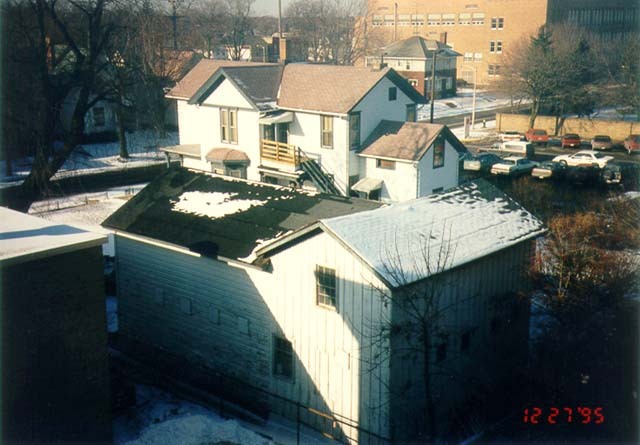 View from the top floor toward St. Catherine's high school. The house in the foreground has an outbuilding that looks like it used to be a barn. 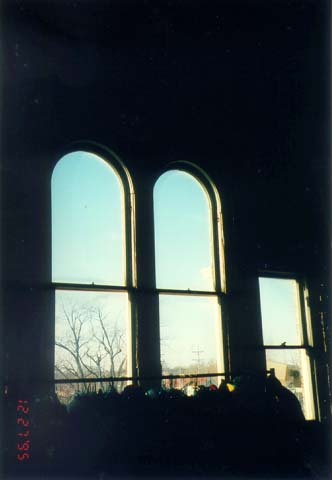 Here, I was trying to contrast the different kinds of windows on the top floor of Winslow School. 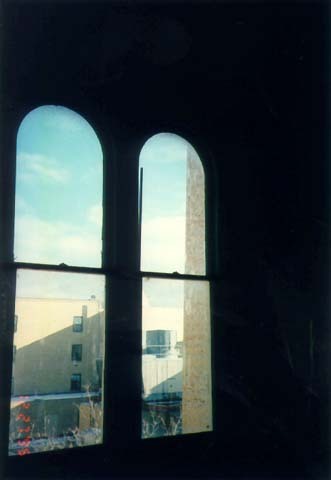 This window looks out onto the west side of St. Luke's Hospital. These windows also face St. Luke's hospital. 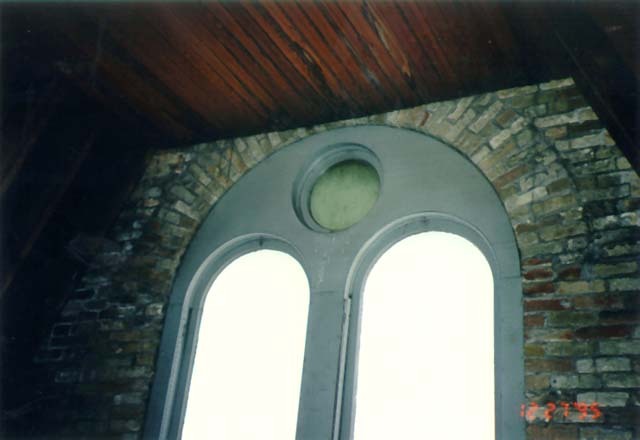 I believe this is the topmost center window on Winslow's east-facing side. Love this post. Great photos. I have similar ones from an 1887-1893 school in Milwaukee. Drove past Winslow today for the first time and stopped to take some photos. winslow school and st lukes hospital are incredibly haunted. im a nurse and i occasionally float to st lukes. weird things happen there its really a very eerie place, it holds a lot of secrets. Well, of course they’re haunted! My mom was a head nurse on the surgical floor there in the sixties. She’s probably still whizzing into closets catching cnas or student nurses taking a break. I fully intend to haunt Winslow after I hit the underground condos. I think my kindergarten class may have been the last year the top floor was used. I remember sitting on the floor singing and watching a movie at Christmas called the Littlest Angel. 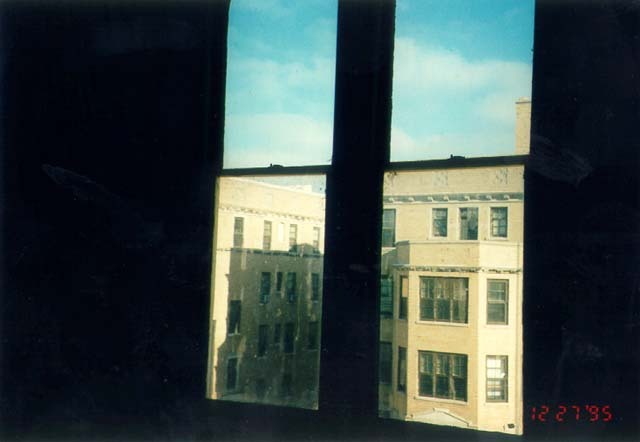 Thanks for the window pics, I do remember them well. Todd, never heard the one about the bodies. Where or what were the from? Maybe that’s why the huge old oak tree near the college ave side where we used to dig holes for pit marbles had so many weird root formations. There was a cemetery on the site where Winslow was built in the 1850s. Are you from MS? I went to this school when I was little, but now live on the MS state line, in TN. 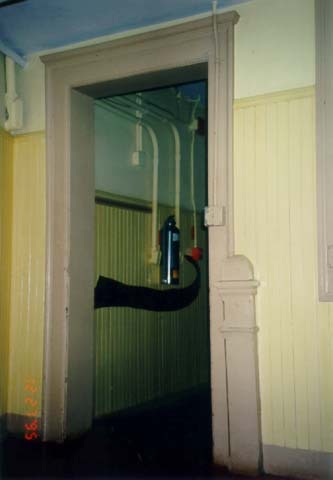 Just curious..
All of this – photos and comments about ghosts – is interesting. I’m glad to see some of the top floor, it’s one I had always wanted to see when we lived across the street. I loved seeing the deep windows below ground level when the kindergarten was down in the basement. Thank you very much for the pictures of Winslow School. My great grand aunt, Mary Gallagher, taught at Winslow and Blaine Schools, from the 1890s to 1930s. My grandmother and aunt (sisters) went there in the late 1890s, they told me that the water WAS called Skeleton Water because it WAS a cemetery around the time of The U.S. Cvil War, possibly back to the 1850s I don’t recall any ghosts but I remember the top/upper floor was put off limits due to structural problems, this was around 1953. Glad they didn’t tear it down as my Aunt, Grandmother, Grandfather, Great Grandfather, Brother, Sister, Lifelong friends and neighbors and myself ALL went to Winslow. I attended winslow around 1981 or 82. I went for kindergarden first and second grade. in 2000 ish my daughter attended kindergarden in the same room I was in. SO MUCH history in one building. Its amazing. This is great! I attended Winslow for Kindergarten in 1975. I have to think that doorway photo is in the basement because it looked instantly familiar to me. I’d love to get in that building again and look around! I really believe it is haunted. We use to play a game in the back stairs at Winslow. This is a Man , what kind of man,a died man. We count to three and left the friends body. And it just floated in the air. We was scared. Never went too the back again.